Well… It's the day after the Super Bowl, and my New England Patriots couldn't beat the New York Giants to claim their fourth World Championship in seven years. It's a depressing day for Patriots fans, but I guess it's a heck of a day for Giants fans. The only thing I can say is “Congratulations.” The Giants played a great game, and truly won the game – the Patriots didn't throw it away. It was an exciting Super Bowl – something that hasn't happened much lately – and of course I would have liked to see the Pats win, but hey… we've been a bit greedy here in New England. What does this have to do with a quilting business? Not much at all. But it does have something to do with attitude and how it affects your business. I'm sure that the Patriots will be taking today to reflect on their missed opportunities. There's going to be a lot of depression, and almost disbelief that they lost the game. But, I can guarantee you that once the initial sting is over, the Patriots will start working towards a successful next season. It's what top-notch organizations do – they learn from their mistakes and continue to strive for success no matter what the world throws at them. 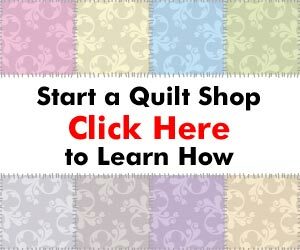 And you can do the same in your quilting business (or the quilting business you're looking to start). You'll have “failures” that feel like the end of the world and that you'll have to quit. DON'T QUIT! Instead, take a good long look at what you're doing in your business, and figure out where you're making mistakes and fix them. If you're not doing enough to market your business, spend a little time analyzing your current marketing programs and then figure out a way to improve and add to the mix to drive more business your way. If you're not making money, take a look at your cash flow and your pricing. Are you priced too low to make a profit? Then you need to determine what you need to do to either reduce your costs or increase your price. When you start to break down your business into smaller and smaller tasks, it becomes much easier to accomplish little things that can add up to big results (and profitability). Today, I feel down in the dumps about a football game. I know it's silly, but sometimes silly things can seem almost overwhelming. When this happens to you, just step back and try to look for some perspective. Then, get back into the game and work to bring your “team” back to the winning side. I know I'm over-simplifying things, but in some ways, business isn't brain surgery. Little things – like creating a new marketing campaign or positioning your business for higher pricing – can be simple. These tasks may seem way beyond your capabilities, but that's only because you don't have the experience. But, as in football or any other sport, practice makes perfect. The more you do these little tasks, the easier they become. And the more successful your quilting business will be.